For the first time in Ireland, completion of an apprenticeship will lead to the award of a Bachelor of Engineering degree. LIT’s new apprenticeship in Industrial Electrical Engineering is a two year programme which will lead to qualified electricians being awarded with a BEng. Speaking at the launch of the programme at the Millennium Theatre in LIT, President of the institute, Professor Vincent Cunnane said, “This is a completely new apprenticeship model for engineering in Ireland. The people who complete this programme will become engineers qualified to play a key role in the design, construction and operation of the factories of the future. “LIT is absolutely committed to this new apprenticeship model. We want to see people achieve progression through apprenticeship-based degrees. We want to see people learning while earning. This is a model which we believe will succeed, and one that can be applied in other sectors. This apprenticeship is at the forefront of how learning is changing in Ireland. “LIT is close to industry, and that’s what has enabled us to introduce this model in Ireland. This new programme is a breakthrough – it is the only engineering degree in Ireland that can be earned through an apprenticeship. “This is one of only two new apprenticeship programmes to be accepted by the government at this point. It was developed in collaboration with the Electrical, Engineering, Automation and Manufacturing Sectors, who identified a need for qualified people to address critical skills gaps in these sectors. The other is an insurance apprenticeship led by IT Sligo. 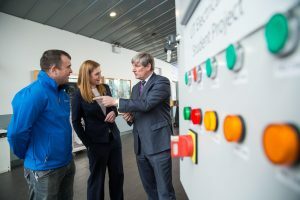 ‎ Barry O’Sullivan, General Manager at Johnson & Johnson Vision Care Ireland said, “This apprenticeship will provide people with the skills that will underpin Irish manufacturing as it makes a major leap forward using intelligent automation and the internet of things. “The reality is that for industry to expand, it requires a pool of people educated in this way. The development of programmes like this helps to secure investment and employment here into the future. “This apprenticeship is a viable alternative to a full time third level course, and reflects the strong demand in industry for “Trade Qualified” Engineers. This is how it must be viewed.